I’m continuing my monthly meal-in-a-jar project with a delicious Beef Philly Cheesesteak Recipe that my Facebook Group members voted on to be March’s meal! You can read more about the Meal-in-a-Jar project at this link and sign up to receive the monthly emails about it! Here is March’s meal for the archives in case you joined the party late and missed it. This month’s Philly Cheesesteaks features four of the March sale items including the Shredded Beef which is heavily discounted for delivery customers. This recipe will fit in one quart jar and feed 4-6 people. Cooking Directions: In a large saucepan bring 2 1/2 cups of water to a boil. Add contents of jar and let simmer for 5-10 minutes. Serve on a hogi bun, in a lettuce wrap, or eat plain as a stew. 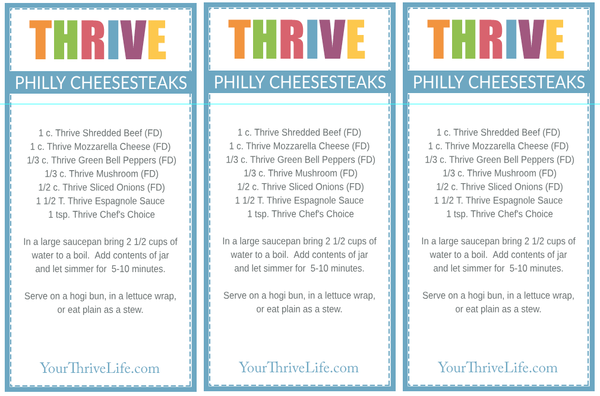 Add these items to your monthly delivery from Thrive Life. Try to not over-scoop so that you don’t run out of some of the items. Settling does occur in some of the products so if you plan for 10 jars you should have enough, but you might be able to get 12 out of them! You should have some leftovers of some items too. Remember feel free to customize your delivery if you already have some of these items on hand or want to substitute a different product or brand. Also make sure to adjust your delivery each month for the new recipe so you don’t get sent the same items again! Click here to set up your delivery service and get your products! Click here to download your labels for this recipe! To get additional information on each month’s recipes like how to adjust for smaller or larger sized meals make sure you join the monthly group emails. Then you won’t miss a single thing!